"Hugtto! PreCure" is the latest work in the "PreCure" anime series by Toei Animation. PreCure fans received an exciting news the other day after a movie preview of the girls from the first generation of PreCure, namely Cure Black and Cure White, appearing together with the current PreCure girls was made public. The fans' excitement is understandable because the upcoming movie will be the first occasion where the girls from a previous generation co-star with current PreCure girls. A total of 55 characters from successive generations of PreCure will star in the movie, which is to be released this autumn, and the fans' expectations' are soaring! 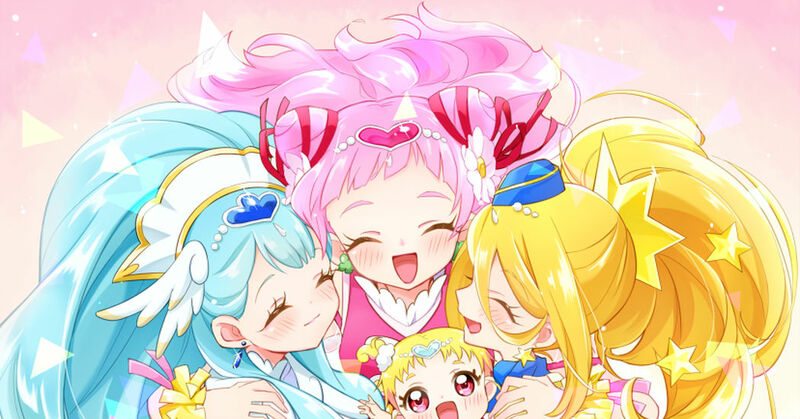 In celebration of PreCure's 15th anniversary, today we're featuring fan-arts of "Hugtto! PreCure", the latest iteration in the PreCure series which has managed to seize the hearts of people of all ages and backgrounds. Enjoy!